Modern low and passive energy homes today use far less energy to heat than their predecessors. However, new heating systems are constantly changing and becoming more complicated and even more expensive. We discuss and introduce a completely new heating system and method on this website. Together they solve the problems of current heating technologies. When we compare HeatWell Systems to the most inexpensive heating solution of the markets, which is electric heating, the initial investment costs are similar. In addition, the running costs of HeatWell Systems are lower than of geothermal heating systems. 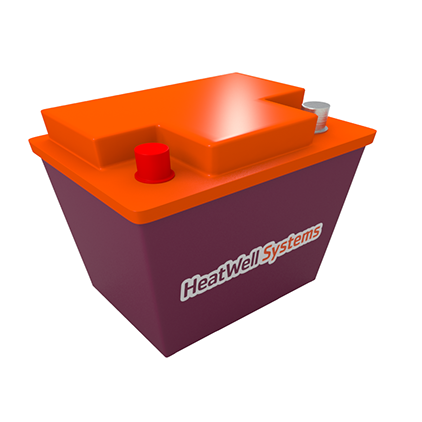 HeatWell System consists of the seasonal heat storage, a system of pipes immersed around it to collect any waste heat, and a regular heat distribution system. The seasonal heat storage is assembled from heat insulation modules and installed under the house. Inside the storage there is a heat exchanger for domestic hot water. The moisture insulation is made from high grade sealed rubber unit. The waste heat piping is similar to that used in geothermal heating systems. The heat is distributed via water or air and circulated through the home using conventional floor heating. It is possible to charge heat to the seasonal heat storage in every way, but there is no need anymore to build actual heat generation system at all. Annual heat leaks of the seasonal storage through an envelope are 5–15 % depending of used temperatures. A large portion of the heat leaks is conducted to inside the house through a roof of the seasonal storage. Heat leaks through a wall of the seasonal storage are salvaged with the waste heat piping. 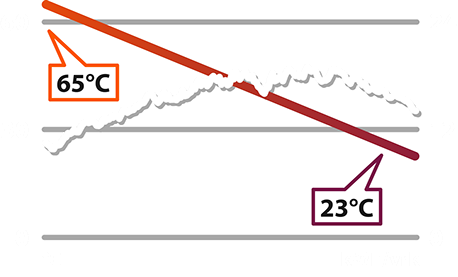 The heat salvaged in wintertime is used to preheat open-air, in summertime it cools supply air. HeatWell Systems comprises of the heating system described above and the Portable Transfer Heating System. This so called heat container consists of a boiler, a burner, and a fuel silo. This fuel storage unit contains wood pellets to heat 2–3 homes for a complete year. The heating container is delivered by flat-bed truck to the seasonal storage and is connected only for the time it takes to charge. One heat container can fulfill the annual heating energy for dozens or even for hundreds of family homes. Wooden pellets are a renewable source of energy, and subsequently they do not produce carbon dioxide emissions. Because the pellet burner operates at a constant nominal power, it does not cause harmful particle emissions and undue smoke. One 210 kW burner produces 10,000 kWh of heating energy in less than 48 hours. Is it wise to build own heat generation system to every house? The one heat container can replace even hundreds of heat generation systems, like boilers or ground-source heat pumps with their chimneys and geothermal heat wells. The competitiveness of district heating is also based on centralized heat generation, but heat distribution is implemented along piping systems. However, it is not profitable to build pipings far from heat generation plants or for small heating demand only. The new heating method brings benefits of centralized heat generation to them, who build houses unreachable from district heating nets or use only a small amount of heat. At the same time, it gives freedom to user to buy heat from where and whenever. The seasonal heat storage makes it possible to fulfill annual heating energy demand with solar heat collectors as well. 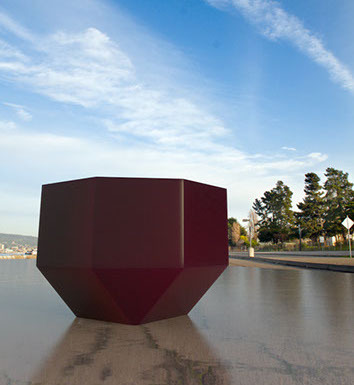 The shape of the seasonal heat storage is rhombicuboctahedron. Why is it so important? Because of its unique shape, the seasonal heat storage keeps warmth well and is sturdy, but it is also easy to manufacture and assemble. This simulation model originates from cooperation with Finnish universities. • The seasonal heat storage improves quality of the house by keeping foundations always dry. • Installation space for the seasonal heat storage is excavated simultaneously with the foundations. • A drain pipe and an inspection well are installed below the seasonal heat storage. • The waste heat piping around the seasonal heat storage is attached to boards, which are embedded to the ground. • The EPS thermal insulator modules are lightweight and easy to assemble by self. • No need for a technical room; all mechanics fits to a man hatch hole located below the floor. • Water and soil filling are made simultaneously. • Here will later come a link to the layout and intersection drawing. • The charging pipeline runs under the house from the seasonal heat storage to the outside wall. • The manual load valves and the distribution manifold of the underfloor heating are located in the man hatch hole. • The seasonal heat storage is coupled to the underfloor heating like the standard hot water accumulator tank. • The closed rubber sac of moisture insulation is made from synthetic rubber (EPDM). • Here will later come a link to the HVAC couplings and control drawing. • The seasonal heat storage is free of service. • The temperature of the seasonal heat storage decreases slowly according to the consumption. • The need of recharging is known weeks or even months before recharging. • If ground water rises to the installation space, it is possible to pump it away through the inspection well. • It is possible to change the closed rubber sac of moisture insulation through the man hatch hole. The most important component of the heating system is the seasonal heat storage. Its manufacturing costs and heat leaks are minimized with shape, protection of designs. Compared to volume, sphere has least surface area causing heat leaks. However, sphere is expensive to manufacture and difficult to assemble. The best approximation of it is rhombicuboctahedron, which is made from four triangles and 13 quadrangles. Triangles and quadrangles are thick EPS thermal insulator modules, which all sides have equal length. The modules are attached together with tongue and groove joint, and the moisture insulation is made from synthetic EPDM rubber. on the 18th of March 2014. The website www.heatwellsystems.com introduces a new heating system and method for small homes. The website will be complemented in the near future with HVAC and civil engineering documents. The negotiations about manufacturing of EPS thermal insulator modules were begun. The negotiations about manufacturing of EPS thermal insulator modules with UK-Muovi took place on the 14th of January 2014. The negotiations about manufacturing of closed rubber sac of moisture insulation with Ogashi LTD took place in Vantaa on the 17th of February 2014. Ogashi LTD imports Firestone’s moisture insulation products. system and method was applied. Timo Helino from Papula-Nevinpat made a patent application for a novel heating system and method for small homes. The patent application was delivered to the Finnish Patent and Registration Office on the 25th of September 2013. • Enquire today for more information! • Interested in a prototype contract?